(This review may contain spoilers and will contain content not suitable for younger people). So… I went from reading a book about the Holocaust to reading one containing sexual abuse. Not exactly light reading, but the former is one we should never forget and the latter is a problem that exists in reality. There were parts of this book that were really difficult to read. A whole town like the one detailed in this book probably does really exist and the fact that it is something that has a major basis in reality was, I think, why it was so difficult to read. I found Dawn to be an interesting character, but although she was a strong person, I actually found her difficult to relate to at times. A lot of the scenes were just told through dialogue, with passages of time skipped over in the next paragraph. And because there was so much dialogue, I found myself being told about things it would have been better off to see. (One of the characters apparently has a drinking problem, but it’s mostly just talked about, rather than seen). I did enjoy reading about Dawn’s relationship with her mother and it was good to see that Dawn was affected by things that had happened in the past. I was a bit disappointed in Tripper’s character, I have to say – and also disappointed not to see more of his parents, who it seems Dawn has no interactions with after what happens to her. I felt the thread with them was kind of left hanging. Some of the supporting characters, particularly the female teenagers, were interesting… but although the word ‘like’ is used in popular culture by teenage characters, I cringed at one line that had it every other word. It read more like a spoof/joke line… which it apparently wasn’t. 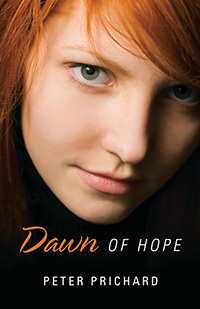 I did also find it interesting to read about Dawn’s coping mechanisms and it was good to see her as a strong lead. Unfortunately, the part where the book shifts to first person was really difficult to read and, I felt, unnecessary. I think this book is worth reading, since it does deal with horrible issues in a more sensitive way. I did feel there wasn’t a whole lot of foreshadowing and I’m not sure I’ll read it again… but I thought it was worth reading the first time.